Hello and Welcome! 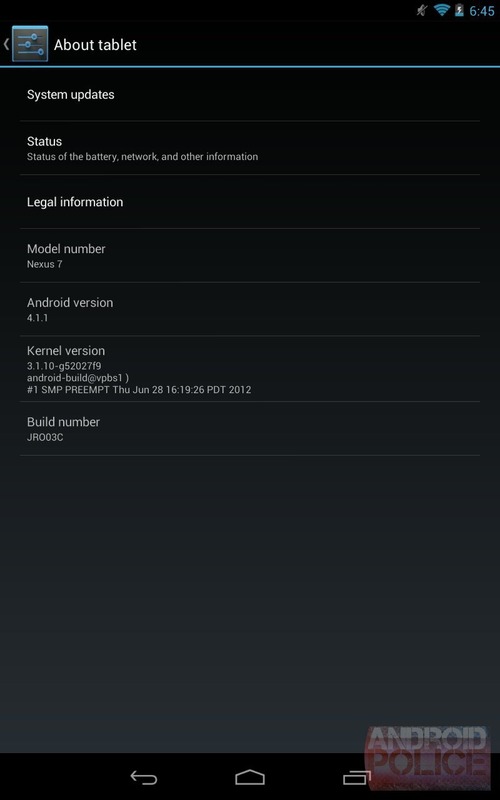 Android 4.1.2 hit yesterday, and, in record time, we are pumping out a new version of everyone's favorite series. If you want to know about everything new in 4.1.2, you've come to the right place. To be perfectly honest, there isn't much to cover. 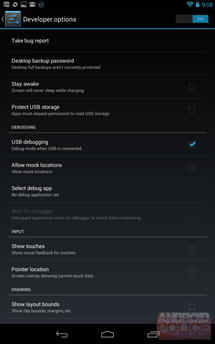 4.1.2 is just as minor as its 0.0.1 version bump would suggest. I've gone over all 164 system APKs (old and new) with a fine tooth comb, and this is all I could come up with. First up, by now you've probably heard of the new, one finger notification expansion trick, and that the launcher has finally learned how to rotate. We saw the commit log earlier, which was a big help for this article. The one thing I can't test is the fixing of this bug, which has to do with connecting to WPA Enterprise wireless setups. I don't have one of those, so I'll just have to take Google's word for it. As usual, the old, 4.1.1 stuff is on the left, and the new 4.1.2 stuff is on the right. 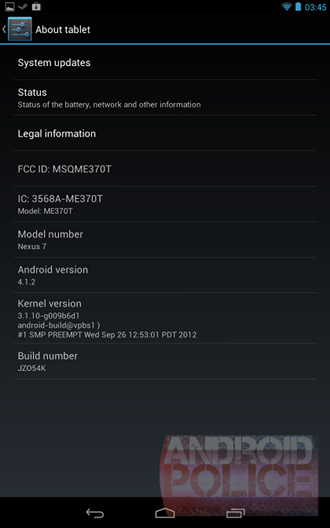 The About screen now shows the device's FCC ID, IC number, and "Model." Yes, there are two fields labeled "Model" now, apparently the one under the IC number is for the actual model number, and "Model Number" is really the market name of the device. Phone stuff is going to be a little iffy. As I'm sure you know, the Nexus 7 is not a phone. Some phone stuff has changed, though, so my best option at this point is to flash a CM10 nightly and hope it's accurate. The commit log tells us a CDMA 1xRTT connection will now show a "3G" icon instead of a "1x" icon, but, in CM10 anyway, that doesn't happen. 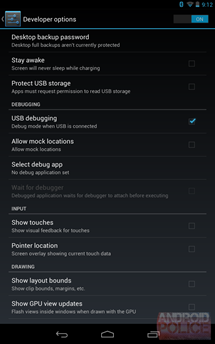 The Cyanogenmod guys didn't mess up, this is actually a configurable option now. 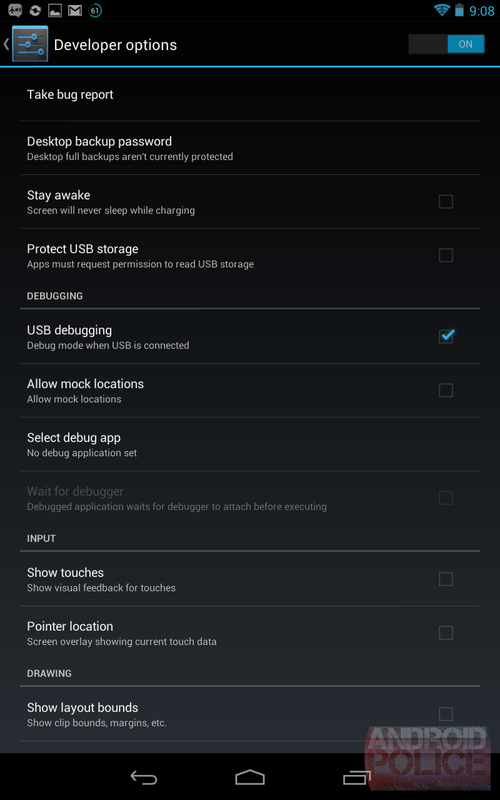 OEMs can toggle this on and off in their Android builds. The variable for this setting is pretty awesome: "mShowAtLeastThreeGees." 1x is slower than real 3G, (it's closer to 2.5G) so this is the previous generation's equivalent of the "everything is now 4G" controversy. 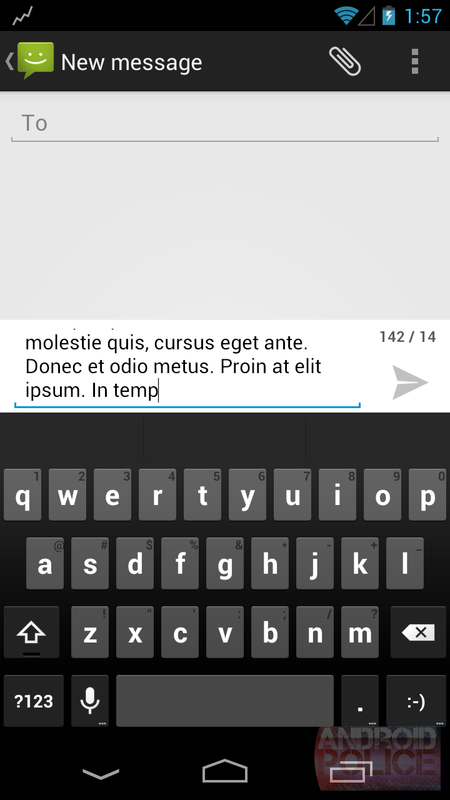 The commit log vaguely states something about adding "contextual 'Voice Mail' text" to the dial pad. It turns out this means that, when calling your voicemail, you'll see "Voicemail" above the dial pad. Handy. Long text messages will no longer get converted to MMS, which was annoying quite a few people. On 4.1.1, after a certain amount of characters, the "send text" button would click over to "MMS" and you'd get a toast popup explaining how Android was going to ruin your message. That doesn't happen now. 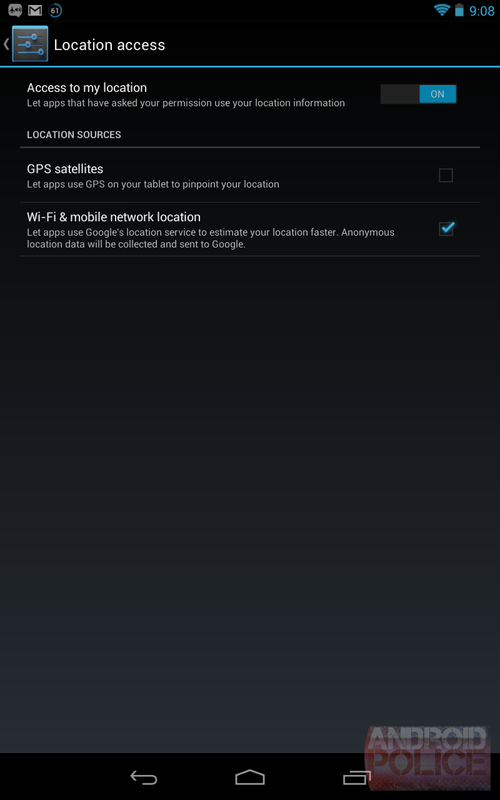 Location Services is now called "Location Access." 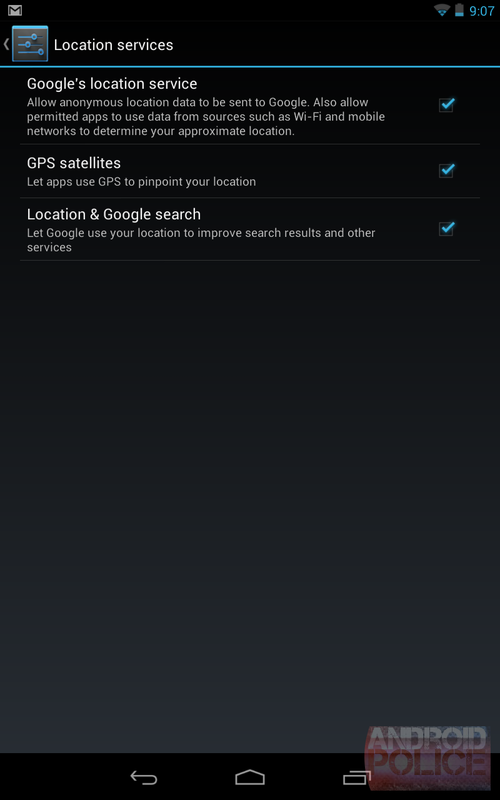 First in the new list of settings is a big kill switch for all location services. Tinfoil-hat types can now rest assured that the government won't be logging their trips to Walmart, or whatever it is privacy-conscious people worry about. 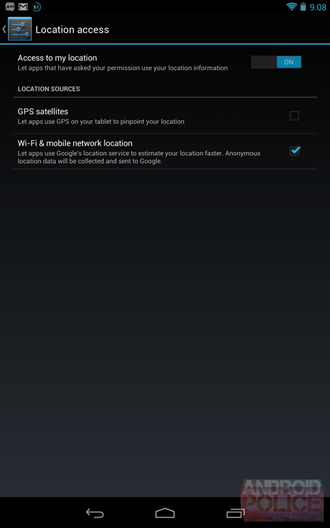 The Google location option has been rolled into the Google Account settings (see below), and its spot has been taken with an option that lets you turn off WiFi and cell tower location. These changes are also mirrored in the initial setup. 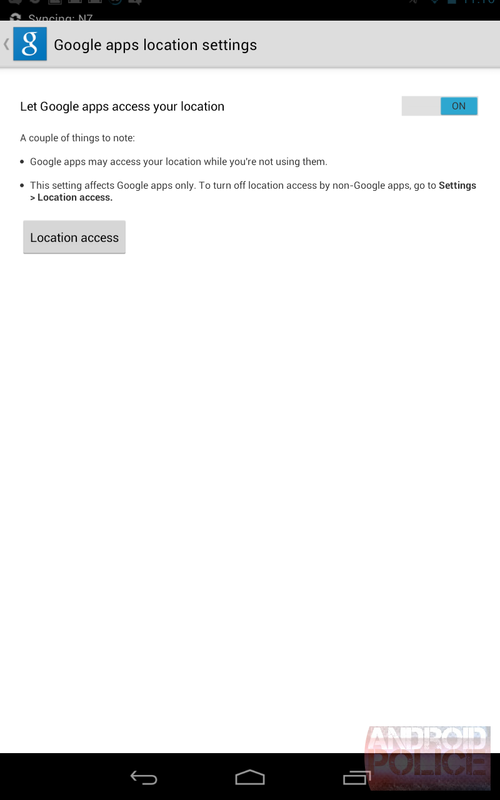 More location changes: In the Google account settings "Location" has changed to "Location Settings," and, for this screen... that's it. Whoa. What's going on here? 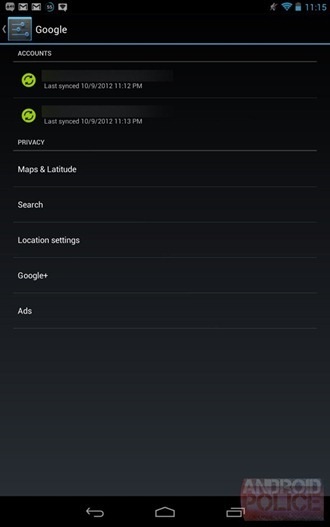 The Google location settings are all kinds of different. We've changed from a dark theme to a light theme, and the title has changed from "Location" to the loquacious "Google apps location settings." 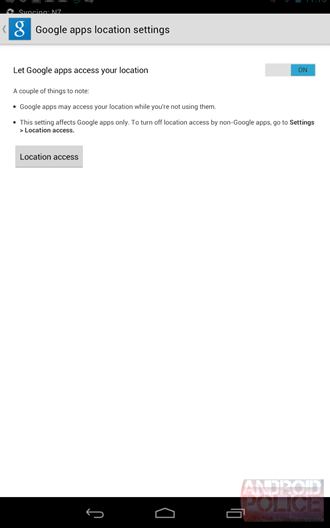 There's another location kill switch specifically for Google Apps, and some text explaining just what is happening to your location info. 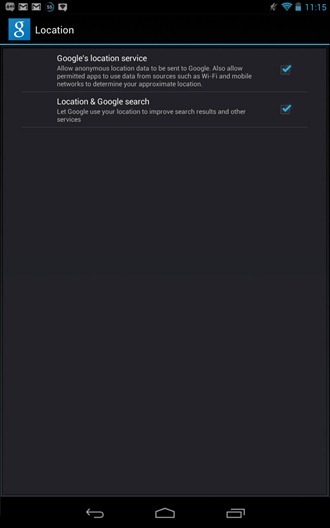 The app icon is now a proper "Up" button, and there's a new "Location access" button that kicks you out to the normal location settings for everything else. Developer options is now home to a new item: "Take bug report." 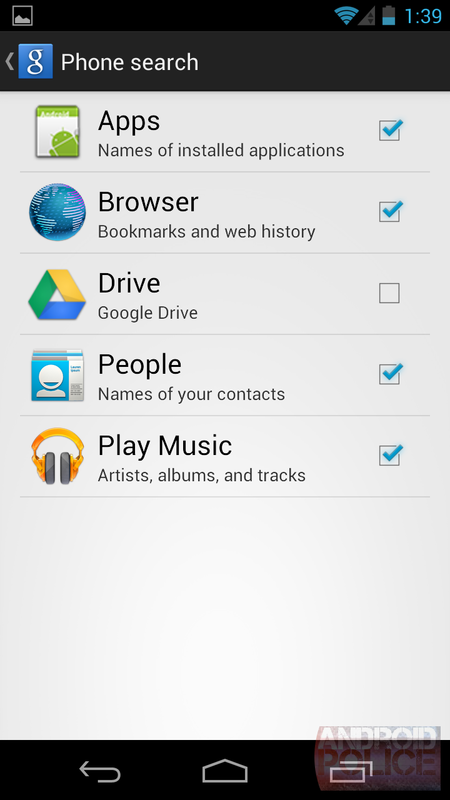 It's right at the top of developer options, so even your less-savvy users can find it. Hitting it will generate a massive 60,000 line text file and email it to someone. The file contains everything you could ever want to know about a device: Build number, kernel information, uptime, all the Linux /proc stuff (meminfo, vmstat, vmallocinfo, slabinfo, zoneinfo, etc), dsmesg, logcat, running apps, and a million other things. People who understand that stuff should have fun with it. However, I'm not really sure why it's called a "bug report" - it's a system log. 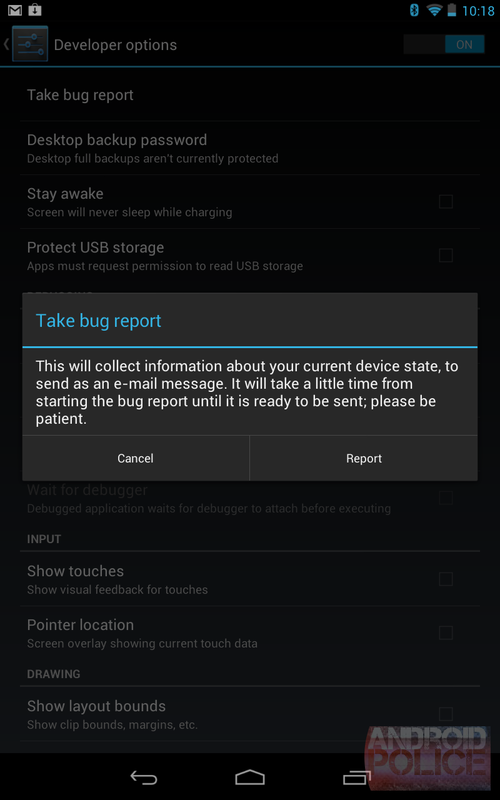 "This really is a bug report -- the same thing you would get with "adb bugreport" etc. One of the things it contains is various logs, but it also contains dumps of process states, networking states, system services, even third party applications can dump stuff to it when it is collected." Yes Google, I noticed this. 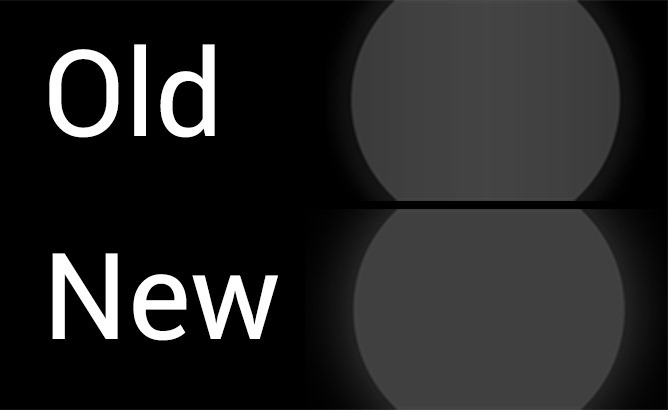 All the touch glows for Back, Home, and Recent are glowier, and the nasty vertical banding has been smoothed out. 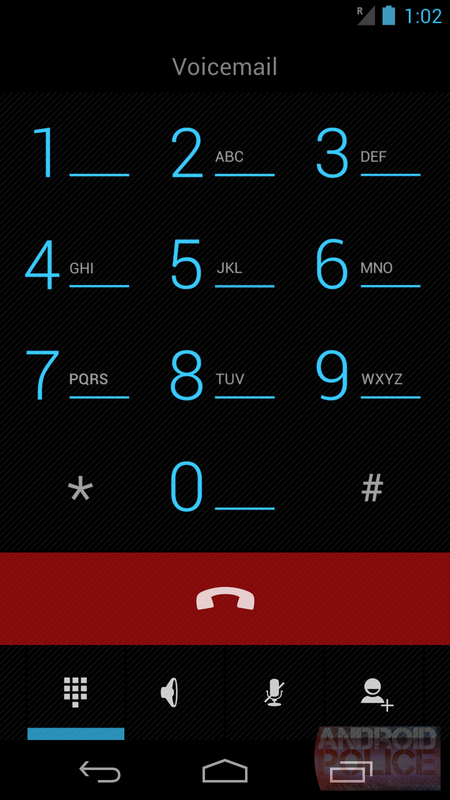 Yes, that's right, the banding wasn't due to poor screen quality, it was built-in to the UI assets. They need to do this in more places - the settings background, for instance, has a terrible gradient with banding in it. After seeing that they messed with the button glows, I was hoping that they would fix the menu button overlap they introduced in Jelly Bean, but sadly, it's still there. That's it for now. 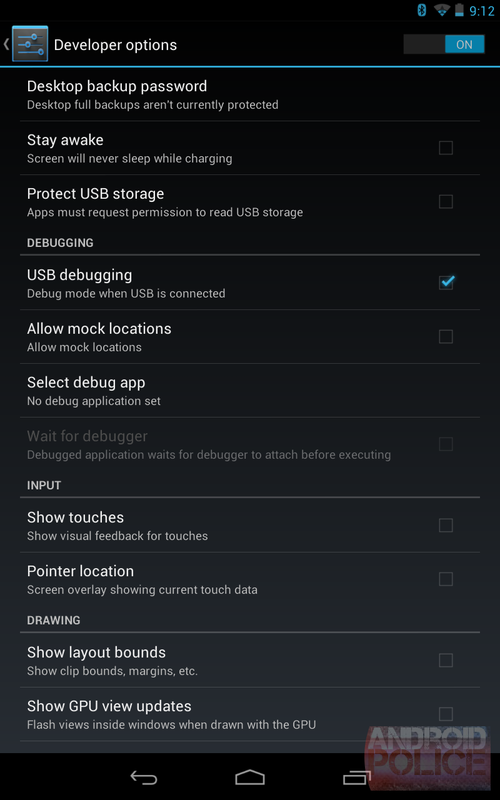 Like I said earlier, there isn't much going on in 4.1.2 - it's mostly bug fixes. This is everything. Believe me, I looked for more, but it just isn't there. Hopefully, next time GTKA is back, we'll have more interesting things to talk about. 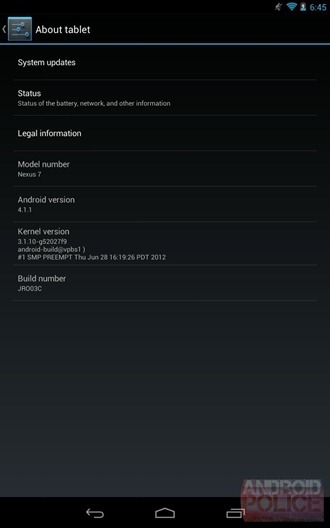 See you all for Android 4.2!